Today is Day 3 of the sugar detox and no cravings yet! I’ve had a good amount of energy for working out, too. I teach an exercise class at work every day. It’s nice to have a break from seeing patients to lead the class for our employees. I’m always pretty hungry after class. It’s a recipe I came up with after buying a ton of ground turkey at Costco. I call it southwestern turkey stew- it’s similar to chili. 1. 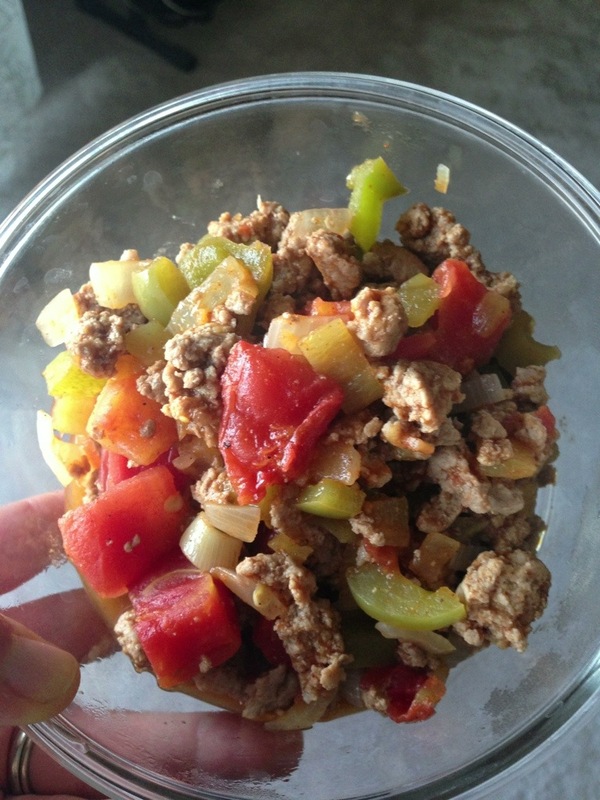 Brown 1 lb ground turkey in a pan and season to taste with taco seasoning or chili powder, salt, pepper, and garlic. 2. In a separate pan, sauté 1 chopped onion with 1 chopped green bell pepper in a bit of olive or coconut oil. 3. Add a can of diced tomatoes and a can of roasted green chilis to the onion and bell pepper and simmer until bubbling. 4. Add the browned turkey to the vegetable mixture and cook through. This recipe makes 4-5 servings and is ready in 20 minutes! It’s a great weekday lunch because you can whip up a whole week’s worth on a Sunday night in no time. Serve with a dollop of plain greek yogurt and shredded cheese!